Nice work! These are classics and there have been countless buildups of them all over the place but I always find new ways of doing it better. Yours are a real help! Looking great guys! Great Star Wars and some Macross rising from the dead. I saw an original Defiant at the thrift store for like $32 (USD). It looked bad so I dismissed it. But first I saw an original Voyage to the Bottom of the Sea flying sub and was interested until I saw it was poorly assembled and obviously opened. Also too expensive. That put me off the first one. I think someone got rid of their childhood models. Just not good when you want to build it before they do. I gotta put down my work and post some pictures! 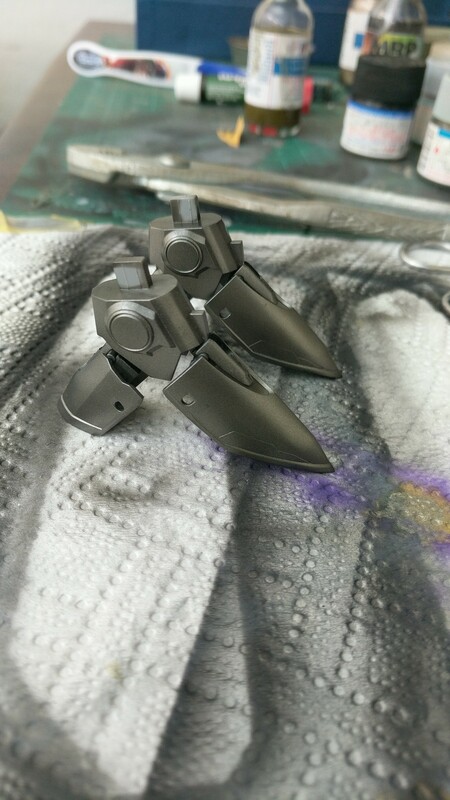 Yeah, I hate those "you can only choose good fit on one side or the other" dilemmas in a lot of kits. Still, you're progressing well with it. Keep those pictures coming. 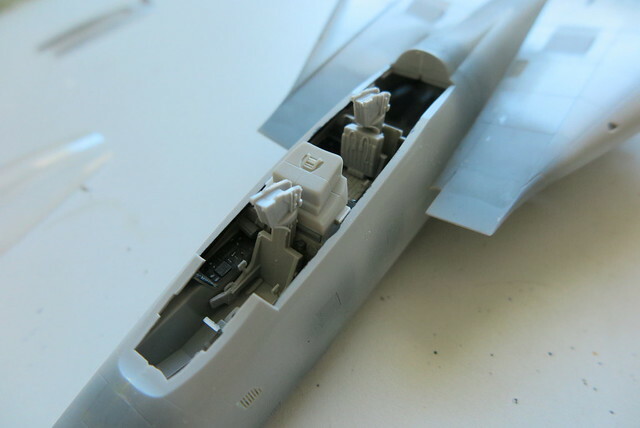 I've been working on a modification to allow the Hasegawa 1/48 VF-1 Missiles to work on the Bandai DX toy. 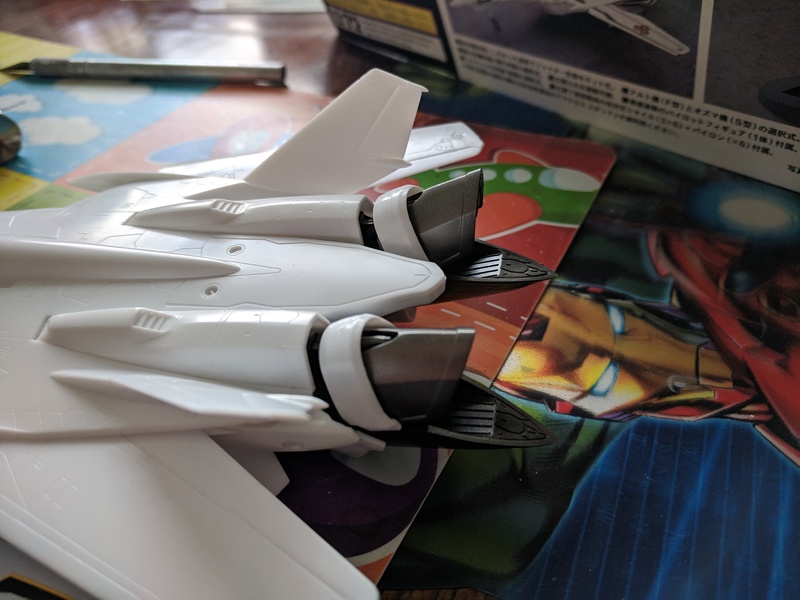 I didn't want to shell out the big bucks for the Missile set from Bandai so went this route of modifying the model kit parts. 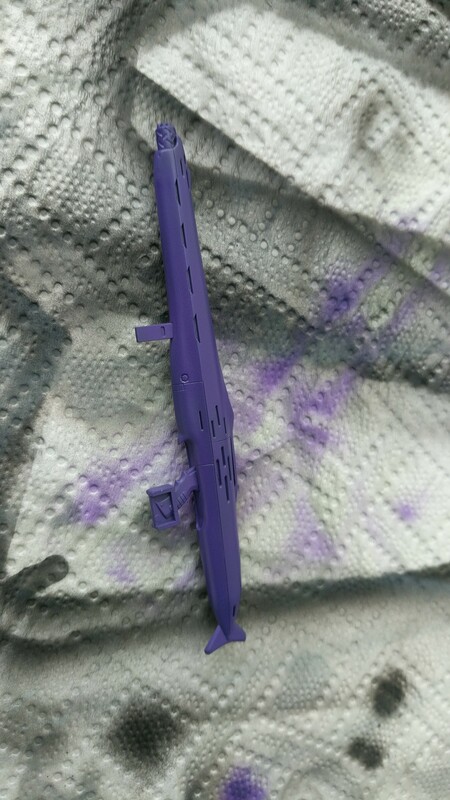 It'll have a bit better "realism" and give me complete control on the finish of the parts but that's about it. The effort so far on my first pylon alone is sitting at about an hour. To do the 4 required, that's 4 hours. And that's just to make the cuts to fit everything together. If you can put money against your time, the Missile set from Bandai is an absolute steal! 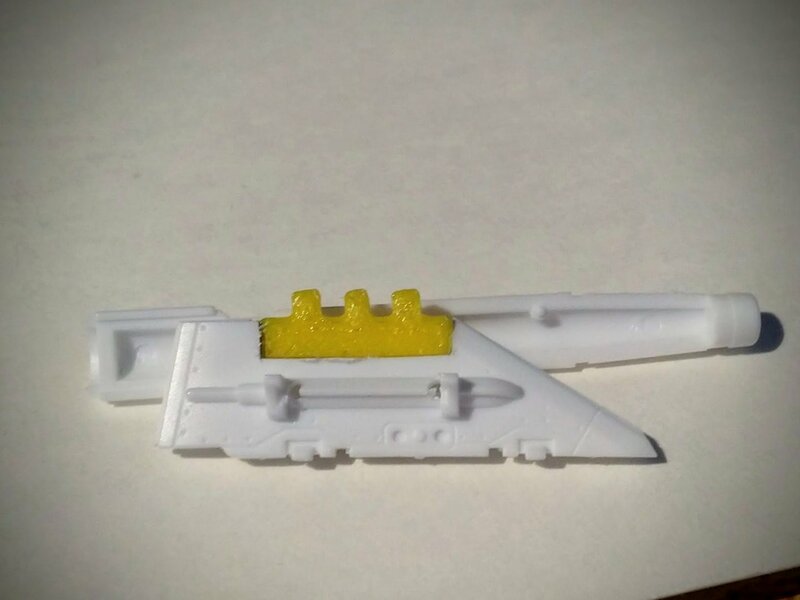 The pylon has been glued together and the yellow 3d printed piece just wedged in there for testing the fit. I'll glue it in properly and add some detail over the cutout so it looks a little more interesting when finished. 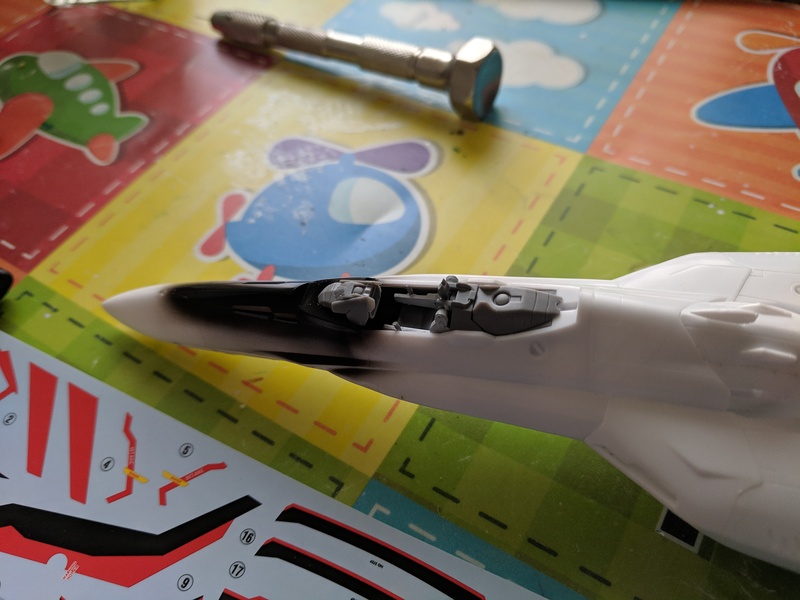 I experimented with holes to help attach the missiles and actually purchased some 1mm x 1.5mm neodymium magnets for this specific purpose. Unfortunately the method for attaching the missiles is so tricky, the magnets just aren't going to work. Just a simple rectangle, marked out and then cut with some very thin photo etch saws. Looks like I'll need to move it down a bit more - maybe to the tops of the side rails instead. 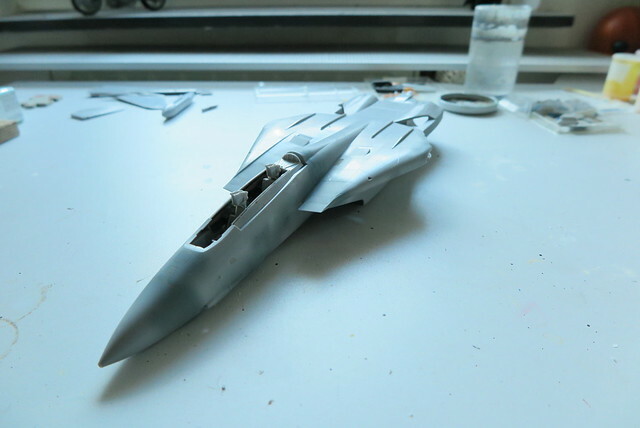 Everything puttied and smoothed out for the nth time and it's starting to look like a Tomcat. 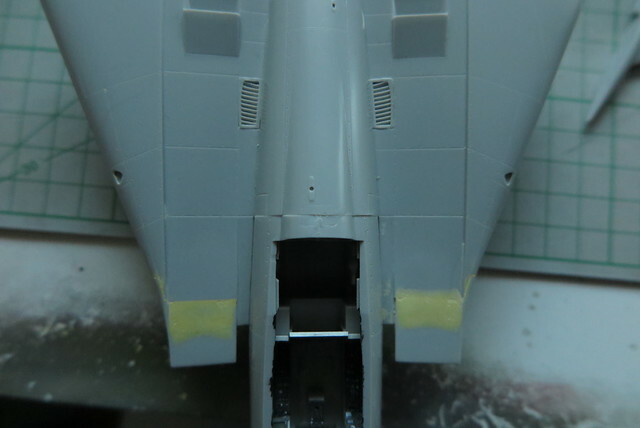 Usually, I'd start painting the fuselage now and finish the cockpit later, but the fit of the canopy is a bit problematic and may require additional putty & surgery. I guess you like the challenge of this old cast. How does the canopy look on it now? It's difficult to catch in a photo - the canopy is 1 mm too wide in the middle section, so you get a very visible step against the fuselage. I guess that's why most builds have the canopy open. 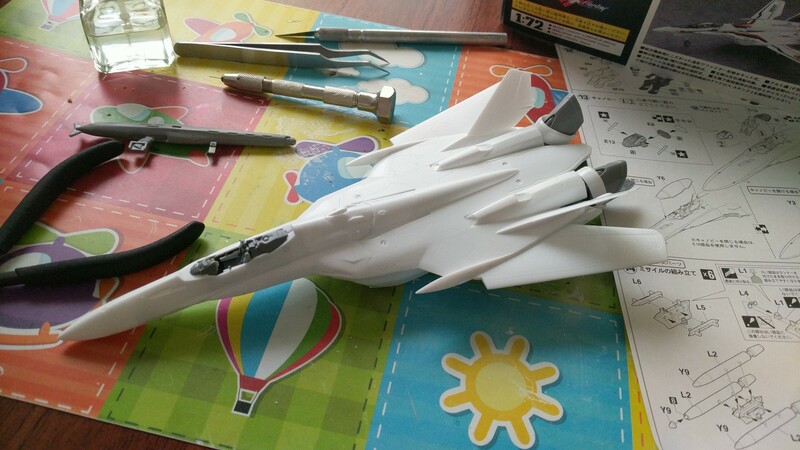 Since the material is so thin at the edge and I don't want super glue on clear parts, there's no hope to force the canopy into the correct width. 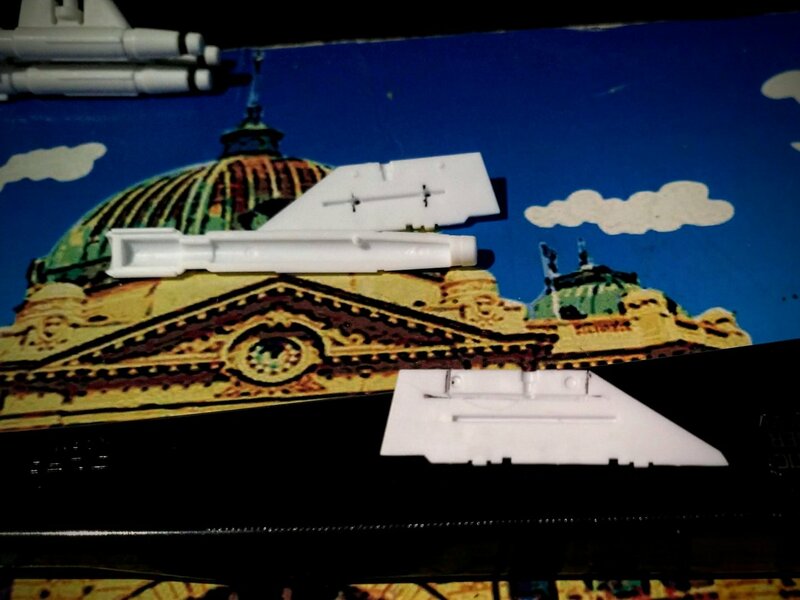 My approach is to glue strips of 0.25 mm styrene onto the RIO's console to widen the fuselage and solve the rest with sanding & putty. 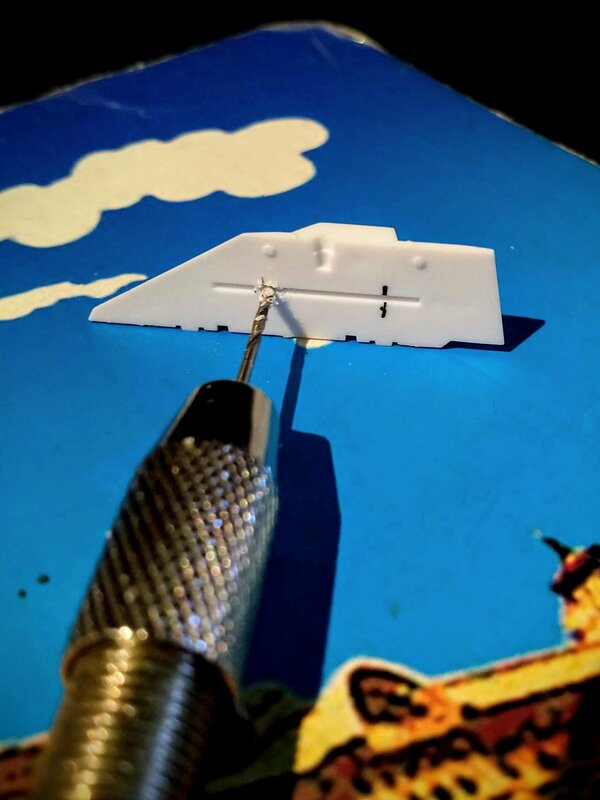 If it is 0.5 mm too wide on each side, I would live with it, rather than risk damaging the canopy or displaying it only on one side.